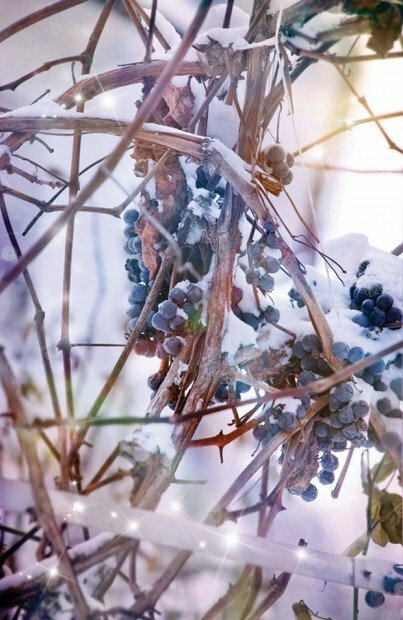 The hearty marquette grape, a descendant of pinot noir, can survive low temperatures, like those that winter brings to Carlos Creek Vineyards in Minnesota. It’s all fun and games when you’re breezing down the ski slopes, starting snowball fights or ice-fishing, but extreme cold weather is definitely not as much fun for the hardy and optimistic folk growing grapes in the northern-most regions of the United States. While grapes are grown and wine is produced in all 50 states, grapes thrive in Mediterranean climates such as California. The Golden State produces 90 percent of all grapes in America. This climate is ideal for Vitis vinifera, the European species of grapes that includes well known varieties such as chardonnay and cabernet sauvignon. These grapes have proven successful elsewhere, in Virginia, New York and many other states, but they have difficulty thriving in the far north where temperatures frequently dip well below freezing. The shorter growing season often fails to ripen grapes, and humidity can cause disease and rot. Growers often resort to burying vinifera vines over the winter, laying down the vines, covering them with dirt and then removing the ground cover once the soils thaw in the spring. These steps, which are neither practical nor cost-effective, are also, in many cases, unsuccessful. 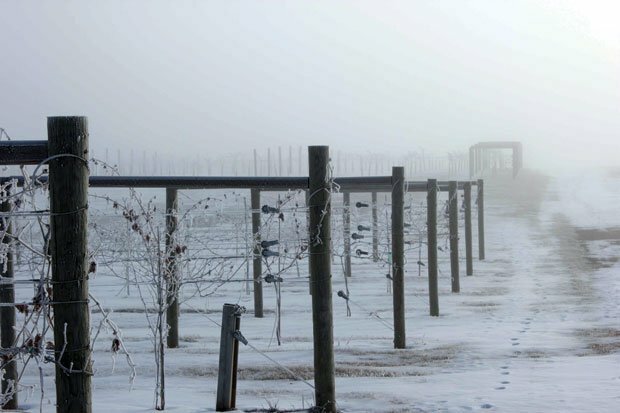 In the face of such difficulty, growers are seeking cold-hardy grapes that can be left on the trellis over winter and withstand temperatures that can fall to -25 degrees Fahrenheit. The University of Minnesota has been at the forefront of cold-hardy grape research for several decades. Researchers have created hybrid grapes such as Frontenac, Leon Millot, St. Pepin, Marechal Foch, all of which can survive extremely low temperatures. These red wine grapes grow under harsh conditions in many states and all make palate-pleasing wines. But chances are, unless you are in the region, you will not have much of an opportunity to taste these wines. That may soon be changing. AppellationAmerica started hearing reports from wine competitions around the United States about a new award-winning hybrid grape said to have many of the characteristics of Vitis vinifera: Marquette. Marquette is a complex hybrid, one that involves Vitis vinifera as well as American species. The hybrid was patented by the University of Minnesota in 2006. Currently planted from Vermont to Washington, the vines are just now starting to produce fruit from mature vines. It is named after Pere Marquette, a Jesuit missionary, and 17th century explorer in North America and has been said by the University of Minnesota to be a cousin of Frontenac and a grandson of pinot noir. Eleven wineries in six states submitted wines for our curious panel to taste and evaluate. As described by the University of Minnesota, panelists anticipated a complex, medium-bodied red described in numerous articles and winery marketing material as having a mouth-feel somewhere in between pinot noir and merlot. Many of the entries had won awards, several of the wineries were sold out of their Marquette wines, and news was that the Marquette vines are in short supply. Growers have rushed to plant this hybrid — some without even tasting the wine first. The buzz was good; would the wines hold up to the hype? All in all, a panel of tasters was delighted with the wines. They evolved quickly in the glass, revealing nuances over the two-hour tasting. In general, the panel found deep ruby-colored wines, light but firm tannins, balancing acidity, lots of fruit, in a light- to medium-bodied wine. There were certainly differences in the wines, perhaps regional characteristics but also winemaking styles. One panelist called Marquette a “winemakers wine,” one where the winemaker can greatly influence the final wine depending on how the wine is treated in the cellar. Marquette is a liquid canvas that allows for all different expressions. Regardless of the differences, the panelists agreed that these would be delightful food wines that could stand in for pinot noir at most meals. While the wines may have similarities to pinot and merlot, they still retain their own distinctive personality, a mix of rustic adventure and refined style. Marquette definitely lives up to its hype and should find its way into wine stores around the country as more growers and consumers start clamoring for it. The consensus? The wines indeed had the medium body, and in some cases, the elegance of pinot noir. The panel found spice, pepper, and lots of the bold fruit flavors found in zinfandel, although some of the wines bent more to the merlot end of the spectrum with darker fruits. Alcohol ranged from 12.7 to 14.5 percent (except the Port at 20 percent).They ranged in price from about $15 to $30, which is amazing for this quality of wine and the difficulty required to bring the grape to bottle. It will be fun watching how the market grows for these young wines and to see how they age. Here are the wines the panel tasted and a summary of the panelist’s notes. • Garvin Heights Vineyard: 2009 Marquette: This first vintage has intense ruby bordering on purple color with a touch of smokiness on the nose. The taste is refreshing and bright. The tannins are light, dry, and slightly prickly. Perfect with grilled burgers or a thick juicy rib eye. Marquette Rosé: Pale salmon in hue with a mineral and white blossom nose. Light with tangy strawberry Kool-Aid flavors. Riverport Rosé Port: Raspberry Tootsie Pop licked all the way down to the chewy chocolaty center. Medium bodied with a light and pleasant sweetness. • Carlos Creek Winery: 2011 Marquette: This is a classic French-styled wine that oscillates between pinot-like red and blue fruits. Round and lush in the mouth. This is elegant and balanced winemaking with a beautiful integration of flavors. The winemaker noted the use of Minnesota oak, so this is truly a local product that would appeal to wine loving tourists and locals alike. A panel favorite. • Saint Croix Vineyards: 2009 Marquette: Fat, round toasted oak — the biggest body Marquette in the lineup. California-styled winemaking. Toasted oak, Santa Rosa plum, vanilla. Another panel favorite. • Tug Hill Vineyards: 2010 Marquette Estate: With a deep ruby hue that paints the glass, this wine is dry with light tannins and palate-cleansing acidity overall make this a nicely balanced wine. • Thousand Island Winery: 2010 Marquette: This wine was another panel favorite with good acid, round tannins and a grape blossom finish. • Fisher King Winery: 2011 Marquette: Tangy and mouth-watering red fruits on the plate, mild tannins and a hint of smoke. We detected higher acid in this wine. An interesting dry, almost powdery, finish. Perhaps the most pinot noir-like in the group. • Tucker’s Walk Vineyard: 2011 Marquette: Zippy acidity. This nicely crafted wine was a first for the panel. Great potential there. • Shelburne Vineyard: 2011 Marquette: Deep ruby, this is a dry, pleasant, light young wine. Very well received until we tasted the next wine …. • 2010 Marquette Reserve: The favorite of the panel. Elegant tannin structure with a clean racy acidity. This well-crafted wine would be enthusiastically welcomed at our Thanksgiving table. This was the no. 1 pick of the panel and may give a glimpse of the future of Marquette. • Park Farm Winery: 2009 Vintners Reserve Marquette: Dry with light astringency, balanced. • Jasper Winery: Sadly, Jasper wines arrived damaged in transit from the winery located outside Des Moines. Barbara Trigg is a certified sommelier and a director of AppellationAmerica.com.